Travelling the Caribbean is often thought to be reserved for cruise ships, luxury all-inclusive resorts, and romantic honeymoons. 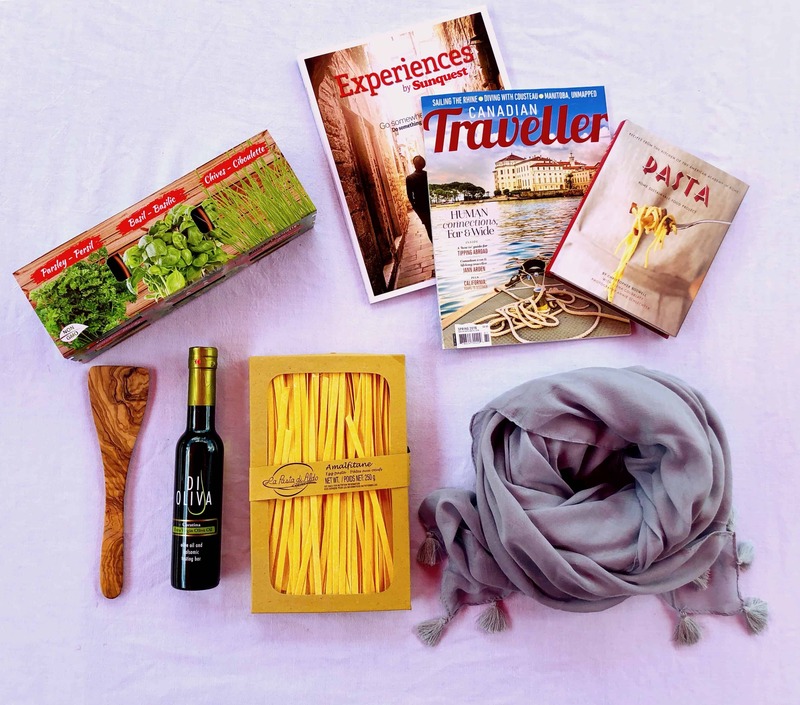 As a solo female traveller on a budget, I do not fall into any of those categories. But I do love hot weather, beautiful scenery, ocean views and contradicting even my own notions of what I think a destination will be. And I can now say, without a doubt, St. Lucia is so much more than white sandy beaches and poolside cocktails. I made my way to Soufriere, the hub of the island's western region. Soufriere was founded by the French and was the original capital of St. Lucia. The town retains the charm of days gone by and a slow meandering way of life that harkens to the days of banana plantations. Today, Soufriere is an excellent base for a traveller like me - one who seeks to escape crowds and who shies from the hustle of the resort-laden north. After an hour of travelling through the mountains in an incredibly stuffed minibus - during which I played with an adorable baby and drank a full litre of water - I arrived at quaint Soufriere, perched in the shadow of Petit Piton. 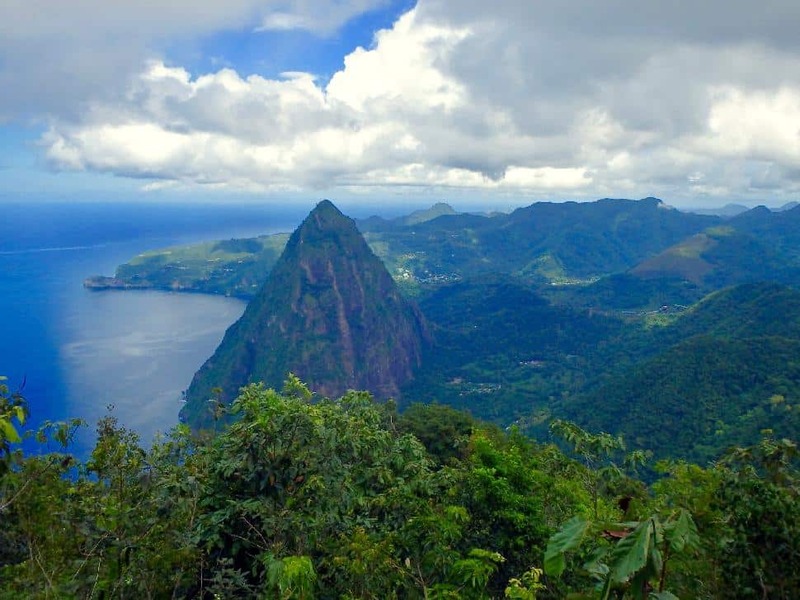 The Pitons, Gros and Petit, are St. Lucia’s national symbols. They are two twin peaks that seem to rise straight out of the sea, forming almost identical cones which uniquely mark the St. Lucian coastline. And my first order of business was to conquer one of them, Gros Piton to be exact. 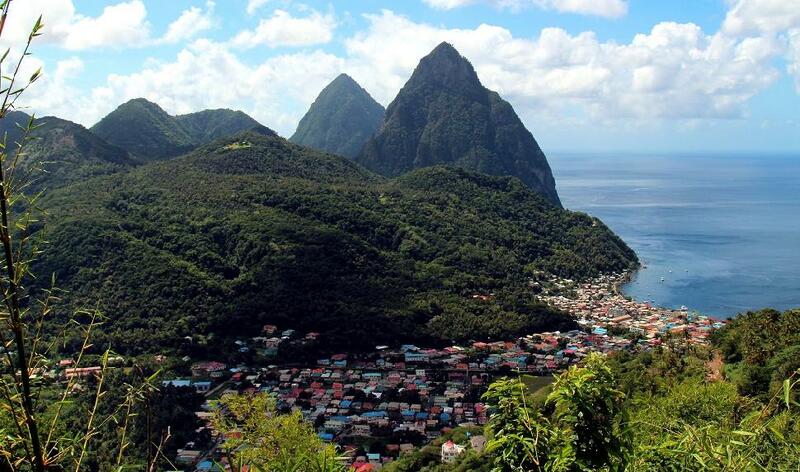 Gros Piton may stand taller of the two Pitons at 786 metres, but the scramble up Petit is the true mountain climb. 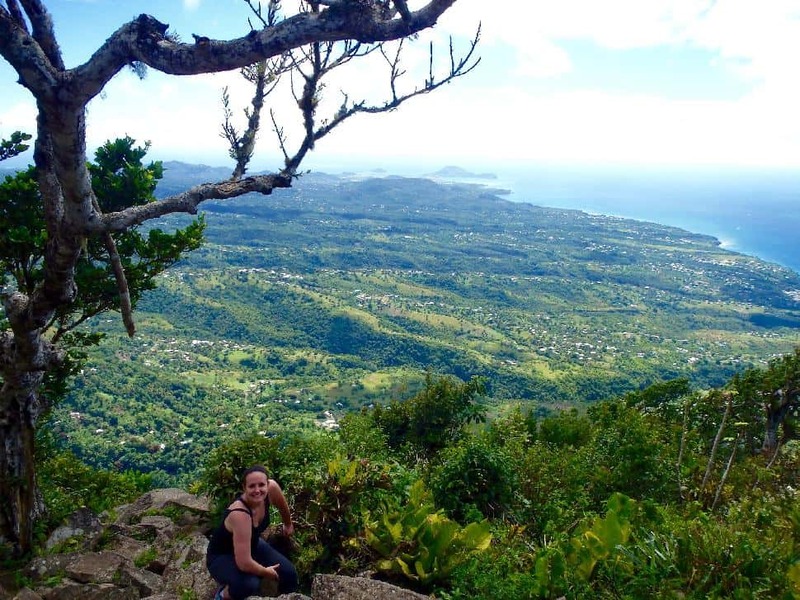 Conversely, those of us in mediocre shape can complete the Gros Piton trail with a pair of hiking shoes and a little determination. My first morning in Soufriere, I hooked in with a French couple from my guesthouse and we took a taxi to the Gros Piton trailhead. With our 17-year-old guide, Quincey, we started up the trail. The key word being “up”. Despite starting early the air was hot and humid, and by the halfway point, my legs were aching and my heart was racing. Thankfully, the views were only getting better. After two hours of walking uphill, and drinking my body weight in water, the views awarded at the top of Gros Piton were truly spectacular. From this vantage point, the verdant greens of the St. Lucian canopy and azure hues of the Caribbean sparkled in the mid-morning sun. Gazing across at the peak of Petit Piton put my position into perspective, making me feel even more accomplished than I already felt. I hesitated to celebrate too much, as the climb down still lay ahead of me. Then it started to rain. Arriving at the bottom (and relatively injury free), I bought a beer from a congratulatory local woman, and drank in the thrill of my morning achievement. 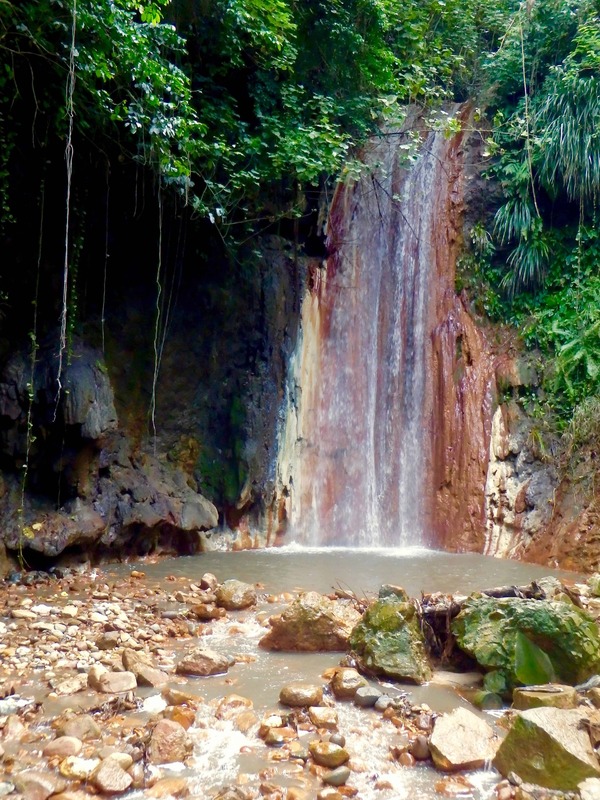 To reward myself and recover my body, I swapped hiking shoes for a swimsuit and headed for a more relaxing way to enjoy the Soufriere area: mineral spas. As St. Lucia is volcanic, the island is home to several natural mineral baths and hot springs. 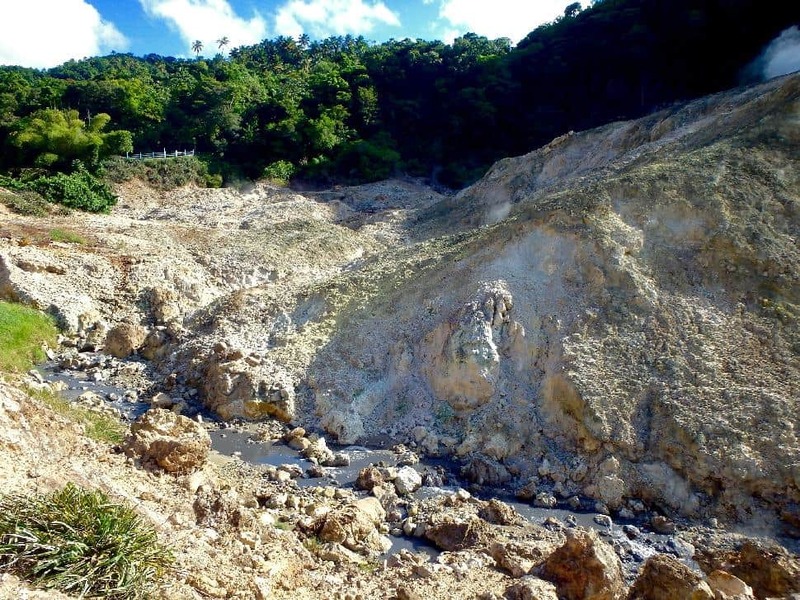 Said to be the Caribbean’s only 'drive-in volcano', Sulfur Springs is a geothermal hot spot where you can follow your nose right up to the bubbling pink, yellow, and green sulfur releases. For my purposes, this sulfuric activity has been harnessed into a small mineral stream that flows into mud baths. Buckets of thick volcanic mud were provided and I spread a layer all over my body. After drying (baking, really) in the sun for 20 minutes, a rinse in the mineral water left my skin feeling smooth, shining, and recovering from the ache of the Gros Piton. But the drive-in volcano is not the only place to soothe your skin in Soufriere. I also visited the Diamond Waterfall and Botanical Gardens. Normally botanical gardens do not throw me that far, but I do love a good waterfall. Plus, the vision of Diamond Waterfall feeding into three warm mineral baths was something I could not resist. 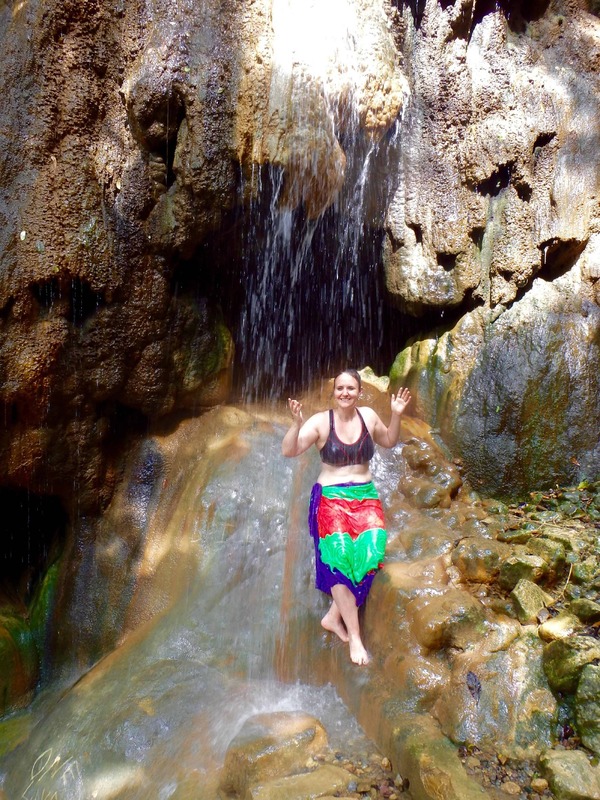 In fact, my favorite mineral bath in St. Lucia was not a bath at all. Jumping on all of the bathing opportunities I could, I backtracked to Piton Waterfall, a waterfall well off the main road. It is touted as a ‘warm water waterfall’ which begged intrigue but had me feeling slightly skeptical. Donning a swimsuit once again, I walked down a slippery set of stairs and found a small waterfall churning down a sheet of rock. No sulfur-permeated air here. I gingerly made my way across the slick rock bed to the tumbling water, which was indeed, the perfect temperature of a warm shower...except outdoors and with strangers. I'm always impressed with a true natural marvel, and there is no pretension or fancy tiled bath at Piton Waterfall. Watching birds swoop through the jungle as I perched beneath a warm, beating cascade made me fall in love with St. Lucia just a little bit more. It's places and moments like this when I renew my love of travel; it's the true pleasure of never knowing exactly how something may be or how a day may turn out. What I discovered in St. Lucia, is that the island and its people are so much more than glossy Caribbean brochures make us believe. 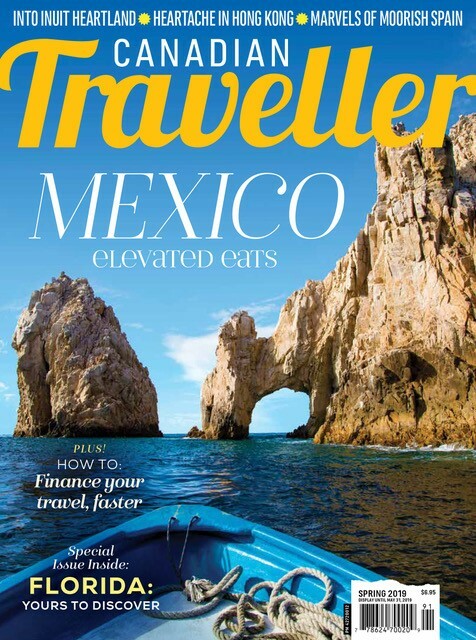 More than beaches and so much more than resorts, sustainable tourism and adventure travel is alive and well. Visiting St. Lucia isn't just couples and luxury rates, as I can well attest. Dive deeper into this exceptional country and find welcoming folks, safe streets, fascinating sights, and unique things to do - all marked with the distinct beauty and flavour of the Caribbean. 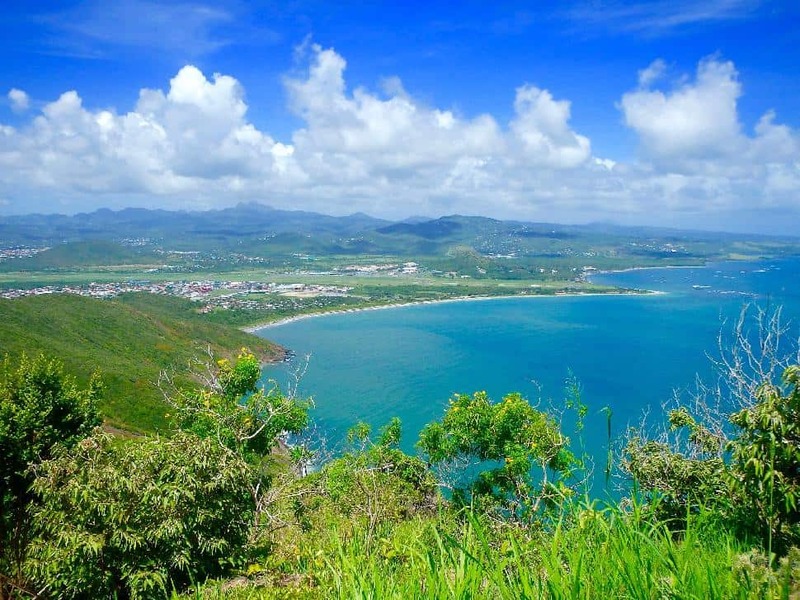 Have you ventured off the beaten path in St. Lucia?